Ekopia directors were present at two ceremonies at plots of land close to one another on Friday 1st December. The first was an event conducted by Craig Gibsone to mark the commencement of construction work for the new social enterprise hub at plots 567/568. Shortly after that an independent gathering was conducted by Park Ecovillage Trust just a couple of hundred meters away to celebrate the official opening of six new affordable flats. 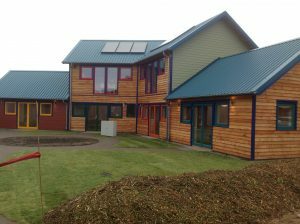 The design/build was undertaken by local company Green Leaf and financial support for the project was received from Duneland Ltd., the Scottish Government’s Rural Housing Fund, and Ekopia members via our Housing Share issue.